Farmers from the up-and-coming capital city, Amaravati, in India, are in Singapore to learn about Singapore’s use of land and integration of services. Indian farmer Gadde Butchi Tirupati Rao is clear on what he would like – the mindset of the Singaporean people. Rao is on a visit here to see what Singapore-style planning can do for the upcoming state capital city of Amaravati in Andhra Pradesh, his home state. “You see, if the government frames one rule or has to frame some law, the people obey it,” he said. “There is no argument about that”. Everything works systematically, he added, citing security, traffic and housing. Rao was part of a group of 34 farmers visiting Singapore. They had handed over their land to make way for the new city. The visit was intended to give them an insight into Singapore’s use of land and integration of services. Rao parted with 6ha of land for Amaravati. But Kalyan Chakravarthi Polu, 28, gave up 17ha. In return, he said they were given 836 sq m of residential land and 209 sq m of commercial land for every 0.4ha. 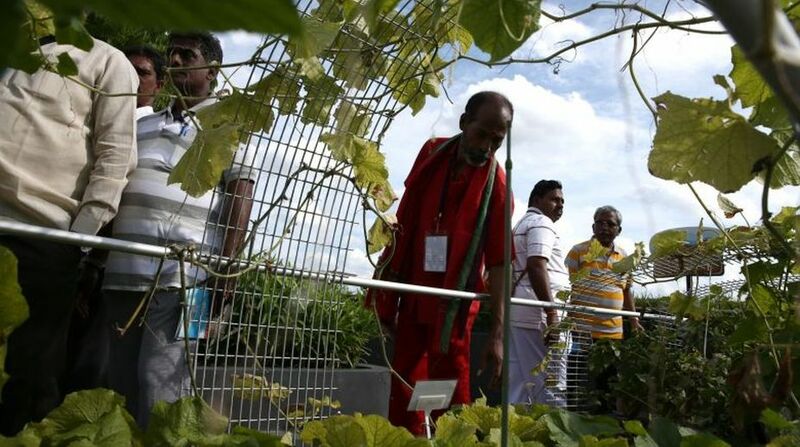 Asked about anything he saw in Singapore that he would like to develop on his plot of land in India, Polu said: “I’m planning to build a mall like this,” referring to the Tampines lifestyle and community hub the farmers visited. The trip here was the second in a series of four visits for a total of 123 farmers from Andhra Pradesh between October and February. Rao has high hopes for what Amaravati could become with Singapore’s help.